When I was being called to found Little Handmaids of Our Sorrowful Mother, among other prayer images and other forms of communication from the Lord, I received three images in which St. Louis de Montfort was the central figure. In two of them he was leading me (a little girl) and some other little girls up a mountain path, and when we reached the top of that path, we found Mary sitting on a rock. In the last image I walked up a steep flight of stairs, and at the top was an office door with a large window in it. 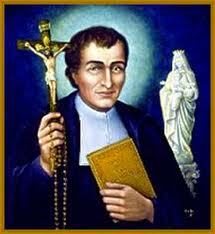 Through the window I saw St. Louis de Montfort sitting at a desk, writing. I saw that from his writing light was shining. I believe that the Lord has directed me on a few occasions to journal with Him about True Devotion to Mary and to share what He shares with me with you, my sisters. I have started this project a couple times in the past and quickly stopped, because I didn’t feel adequate to accomplish it. 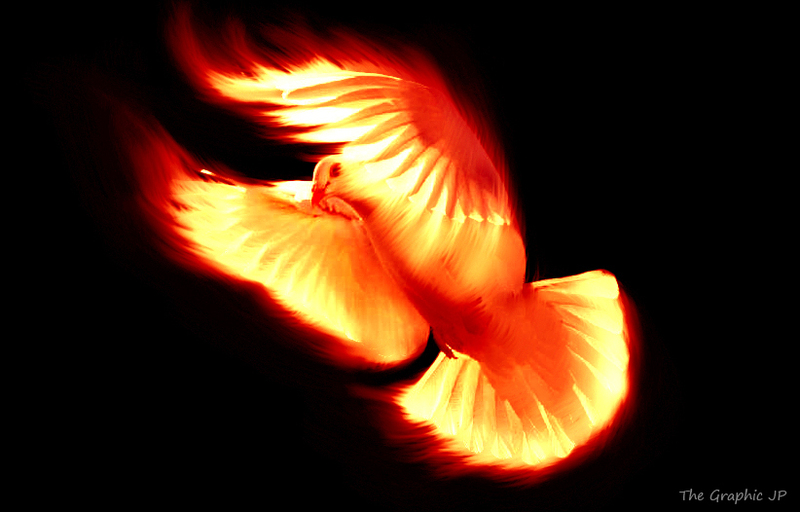 The Holy Spirit has set a fire in my heart to begin again, and He has given me a confidence that now is the time to persevere in it. I believe that He has communicated to me that this book of St. Louis de Montfort, so deeply respected by several popes, is the foundation of our identities as little handmaids. I ask for your prayers, that I will discern clearly what the Holy Spirit wants me to share with you. Please also pray that He will give me the grace to persevere and complete this project. For the glory of God and the honor of our Sorrowful Mother! "...through her He must reign in the world." 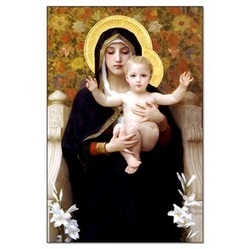 True Devotion to Mary #1- It was through the Blessed Virgin Mary that Jesus came into the world, and it is also through her that He must reign in the world. What light do You want to give us on this truth? I had a mental image of Jesus and Mary with Their Hearts exposed, holding hands. I have the sense that it represents Jesus and Mary’s united Hearts; and that it means that they are united in carrying out God’s plan for the salvation of the world. Jesus is our Savior. Mary cooperates with Him in bringing His salvation to the world. Mary’s life is totally united with His. Where we find Mary, we will find Jesus, and vice versa. Each of God’s children has a vocation. My vocation (calling) is my part in helping God to save souls. It is never meant to be just a means to save myself. It is through helping to save others that I most fully receive the salvation that Jesus holds in store for me. My family is the place where God has planted me, in order that I may grow roots of virtue that will mature, blossom, and bear fruit. It is that fruit that grows in my heart and soul that I can bring out into the world to share. Mary’s vocation was to bring Jesus (the Messiah of the Jews and the Savior of the world) into this world. Now, as St. Louis teaches us, it is also through her that He must reign in the world. As little handmaids, we share the vocation of our Mother, the handmaid of the Lord, to bring forth, in union with her, the reign of Christ in the hearts of all of God’s children. To fulfill this vocation, we must first permit Jesus Christ to reign in our own hearts. It is through our Sorrowful and Immaculate Mother that we receive the grace to submit to God’s plan that His Son reign in our hearts, that we may share that grace, through living God’s plan, with our brothers and sisters in Christ. True Devotion to Mary #2- Because Mary remained hidden during her life she is called by the Holy Spirit and the Church "Alma Mater", Mother hidden and unknown. So great was her humility that she desired nothing more upon earth than to remain unknown to herself and to others, and to be known only to God. Little handmaids remain hidden in the Suffering Heart of Jesus. Then I saw the Lord Jesus nailed to the cross. When He had hung on it for a while, I saw a multitude of souls crucified like Him. Then I saw a second multitude of souls, and a third. The second multitude was not nailed to [their] crosses, but were holding them firmly in their hands. The third were neither nailed to [their] crosses nor holding them firmly in their hands, but were dragging [their] crosses behind them and were discontent. Jesus then said to me: Do you see these souls? Those who are like Me in the pain and contempt they suffer will be like Me also in glory. And those who resemble Me less in pain and contempt will also bear less resemblance to Me in glory. Little handmaids, my sisters, Jesus is calling us to remain hidden—like His Mother, like the good thief—in His Suffering Heart. We all need to become good thieves: sincere, repentant, humble, and thirsting for the Lord. "In her Canticle (the Magnificat) Mary does not say she is happy because God was looking to her virginity, to her kindness or to her sweetness – all of them virtues that she possessed – no: because the Lord was looking to her humility, the humility of His servant, her smallness. This is what the Lord looks for. And we must take heed of this wisdom and put ourselves on the margins so that the Lord may find us. He will not find us at the center of our certainties. That is not where the Lord looks. 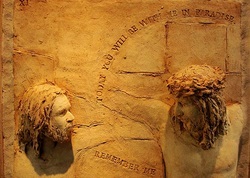 He will find us on the margins, in our sins, in our mistakes, in our need for spiritual healing, for salvation; that is where the Lord will find us”. True Devotion to Mary #3- In answer to her prayers to remain hidden, poor and lowly, God was pleased to conceal her from nearly every other human creature in her conception, her birth, her life, her mysteries, her resurrection and assumption. Her own parents did not really know her; and the angels would often ask one another, "Who can she possibly be? ", for God had hidden her from them, or if he did reveal anything to them, it was nothing compared with what he withheld. When we “abide in” Jesus, we “remain hidden” in Him, in the Heart of Our Sorrowful and Immaculate Mother. When we abide in Jesus, we remain hidden in Him, in the Heart of Our Sorrowful and Immaculate Mother. Do you want to say anything to me about this, Mother? An image that came to me several years ago comes to mind. In the image I knock on the door of a large, spacious, rich-looking house. The Blessed Mother opens the door and hugs me very warmly, like she’s been expecting me. Her embrace communicates to me that I am her daughter. She leads me into the living room, where there is a fireplace, and there on the floor is the Little Boy Jesus—maybe 2 years old—and I become His age and begin playing with Him. True Devotion to Mary #4- God the Father willed that she should perform no miracle during her life, at least no public one, although He had given her the power to do so. God the Son willed that she should speak very little although He had imparted His wisdom to her. Even though Mary was His faithful spouse, God the Holy Spirit willed that His apostles and evangelists should say very little about her and then only as much as was necessary to make Jesus known. A little handmaid's soul will magnify the Lord in our Mother’s Heart. When I returned home from my solitary pilgrimage to Medjugorje in 1991, a devout Catholic man who had a great love for you asked me excitedly: “Did you see Mary there? Did you experience Mary?” I was actually surprised by his questions, because—while, yes, I did experience your loving, gentle presence on a couple of occasions in Medjugorje—what awed me on my pilgrimage was my experience of God—the Father, the Son, and the Holy Spirit—more powerful than any time before or since. Your soul “magnified the Lord” for me there. That experience of God’s Presence, and the conversion that has grown from that seed, is the miracle that God worked and is working in my heart and soul. I was “introduced” to the Holy Spirit on the last leg of my trip, on the bus that ran the 30 miles from Mostar to Medjugorje. Tears started flowing from my eyes, like the stream that flowed when St. Bernadette, at Our Lady’s direction, dug in the ground near Lourdes. It was Our Lady who was “digging” in my heart, through her intercession, to bring me the “living waters” of her Divine Spouse—the waters that came to heal my heart and soul. Those tears flowed for the half hour trip to Medjugorje, as I sat embarrassed next to the Yugoslavian lady with whom I shared the bus seat. Every time I walked into St. James Church in Medjugorje the tears began to flow again. The first time I went into the church, to which I walked after I had bathed and taken a nap, I felt the Presence of God so powerfully, I was compelled to kneel down in the middle of the aisle at the back of the church. Having left the Church almost thirty years before, I did not realize at that time, but was informed later that I had gone into the church at the time of Benediction, and so I had experienced most powerfully, through God’s gift, the True Presence of Jesus in the Blessed Sacrament. As little handmaids we are given the gift, through union with the Sorrowful and Immaculate Heart of Mary, to come into the Presence of God—our Father, our Redeemer, our Sanctifier—in order to become one with Him. When we come into that union, our soul, also, will magnify the Lord in our Mother’s Heart. True Devotion to Mary #5- Mary is the supreme masterpiece of Almighty God and he has reserved the knowledge and possession of her for himself. She is the glorious Mother of God the Son who chose to humble and conceal her during her lifetime in order to foster her humility. He called her "Woman" as if she were a stranger, although in his heart he esteemed and loved her above all men and angels. Mary is the sealed fountain and the faithful spouse of the Holy Spirit where only he may enter. She is the sanctuary and resting-place of the Blessed Trinity where God dwells in greater and more divine splendor than anywhere else in the universe, not excluding his dwelling above the cherubim and seraphim. No creature, however pure, may enter there without being specially privileged. Little handmaids are specially privileged to be offered the charism of contemplative union with Our Sorrowful Mother’s Heart. When I read that last sentence in St. Louis de Montfort’s #5 teaching, my heart was pierced—it seemed to me, more powerfully and deeply than ever before. My heart was pierced with the Sorrow of our Mother, as she suffers with Jesus in the hearts of all of her suffering children. It felt like a physical piercing, and it was so intense that I couldn’t do anything for an hour or so, not even write. For each of her little handmaids, Our Sorrowful Mother holds in store the charism of contemplative union with her Sorrowful Heart, in union with the Suffering Heart of Jesus, suffering in the hearts of “the least of these” His brothers and sisters. This union with Our Sorrowful Mother’s Heart transforms our hearts, restoring our true dignity and vocation as women, and moving us to pray with her in compassionate intercession (in union with the Suffering Jesus) for all of her suffering children, our brothers and sisters. It is a gift, yet it is not given out to just anyone, like trinkets thrown from a Mardi Gras float. We must show our fervent desire for that gift by meditating daily on our Mother’s Sorrows, whenever possible, through the praying of the Rosary of the Seven Sorrows of Mary. Then God, in His wisdom, will give us in His time the gift of contemplative union with Our Sorrowful Mother’s Heart, in which we not only think about the mysteries, but experience directly the Sorrow in her Heart.